You probably have done frustum culling in your 3d engine at some point. It's cheap to compute, and it can save the cost of rendering quite a big deal of objects. However, most size-coding demos and intros don't use it because it can involve quite a lot of code to do. As usual, things don't need to get as complex as most tutorials tell you. This article is about how to implement a fully functional simple, clean, with no dependency on external code, and small frustum culling. It can also serve as an example of how a 4 kilobyte demo coder might approach code optimzation. So, to put things in context, the idea is to precompute some definition of the camera view frustum that will allow quick and inexpensive rejection of objects at rendering time. Let's assume you have a perspective based camera for this article (orthographic frustums are even easier to handle, so I leave that as an exercise to the reader - yay, I always wanted to say this). 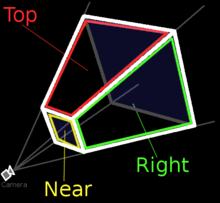 So, we have a camera defined by a field of view, an aspect ration, a near and far clipping distances. I assume that objects that will get tested against the frustum have bounding spheres (or even boxes) defined in camera space. So out camera is centered at the origin and is looking in the negative z direction (yeah, an OpenGL style coordinate system). The first line is the first clipping plane, and it's made of 4 flotas, as all 3D planes. It passes thru the origin (third coefficient is 0.0), it's perpendicular to the yz plane, and it points IN the frustum volume (so, it's the top plane). Note that is normal vector is (0, -co, si), which accidentally has length 1 (ooops! ), and it makes and angle of atan( si/co ) = atan( sin(an)/cos(an) ) = atan( tan(an) ) = an radians with the z axis, exactly as we want. Similar reasoning goes for the following 3 planes. The last two planes, the near and far clipping planes, are trivial: far clipping plane is defined as z=-zfar (remember, z is negative when looking forward) so the equation is z+zfar=0, ie, (1,0,0,zfar). Same for the near clipping plane (both have unit length normals already, oops!). The frustum is stored in 24 floats, which can be a local array in the callee function. No need for structs or other stuff. Last step is to divide the 4th plane by znear, and the 5th by zfar, then to multiply the rest by si, and we pretty much arrive to the final code, which much smaller than the original one, and much more intuitive, as you can see the plane equations directly in the code.